J&N Feed and Seed is proud to stock CCI ammunition . What ever your needs are, we’ve got the right product for you. Stop in today and take home a box or two. You might never need to stop an ornery alligator, or depend on your marksmanship to put food on the table, but with the new Troy Landry signature edition ammunition from CCI®, you’ll know you can. 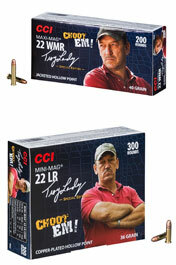 Included in the exclusive series are CCI’s proven 22 Long Rifle Mini-Mag® and 22 WMR Maxi-Mag®-loads that Landry, from the series Swamp People® on HISTORY®, has trusted his livelihood to for decades. Look for both cartridges in eye-popping gator-hide packaging, with Landry’s face on the box. This entry was posted on Friday, May 8th, 2015 at 4:00 pm	and is filed under News & Updates. You can follow any responses to this entry through the RSS 2.0 feed. Both comments and pings are currently closed.